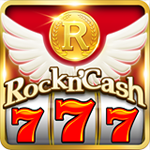 Enjoy unique amazing slots & the ultimate online casino experience in Rock N’ Cash Casino! Casino includes blackjack, Texas hold’em and slots free play for joining! Available mobile for Android and iOS. Play on Facebook!